Keep your spending in check and get alerted when people spend more time on a task than they should. The ALL option shows both kinds of alerts at the same time. The default first alert at 80% of tracked hours can be customized to any time. Just click your name in the upper right corner of the screen and select Settings. Next, go to the Company Settings tab, where you can select a new Critical limit for the 1st alert. The default value is 0.8, i.e. 80%. If you don’t want to see the displayed alerts anymore, just click the Hide button. If you hit it by mistake, don’t worry, click it again and this will undo your previous action, displaying the alerts again. Select Company in the top bar and then click the Alerts tab to see all of the alerts for all your projects in one place. This only works for Admins, as other user roles can’t see this tab. There’s no need to access Costlocker to see who has exceeded 80% or 100% of their estimated hours. 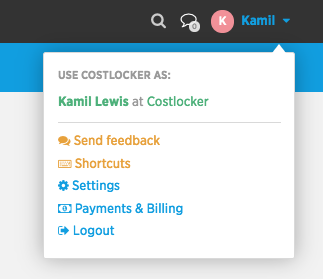 If you have a developer on your team, you can integrate Costlocker with Slack and receive simple notifications as messages directly.